The Super Bowl is much more than a showdown between AFC and NFC championship teams, it’s a days long extravaganza. On the days leading up to February 3, hundred of thousands of out of town visitors will descend on Atlanta for Super Bowl LIII and a million people (so says Atlanta Convention and Visitors Bureau) are expected to attend happenings scheduled around the event. Dear reader, whether you are a guest or a local who will be inquired upon by guests, we are here to help. Atlanta is home to the world’s busiest airport, housing the largest air passenger terminal complex, covering 2.5 million square feet. The terminal is designed to accommodate up to 55 million passengers a year. Hartsfield-Jackson Atlanta International Airport expects 200,000 passengers arriving per day from Feb. 1-4. They won’t all fit in Mercedes Benz Stadium with a capacity of 75,000, but there’s plenty to see and do (and eat) in the city beyond the home of Atlanta Falcons and Atlanta United FC. The official host committee has even enlisted 10,000 volunteers, to be placed at the airport and hotels and NFL events. They will be around to guide folks to The World of Coca Cola, the College Football Hall of Fame, CNN Headquarters, and Centennial Olympic Park, the legacy of the 1996 Olympics. Walking distance from the stadium lies The Georgia Aquarium, the largest in the Western hemisphere, casing more than 10 million gallons of water. Food halls have become a fixture of our dining scene. 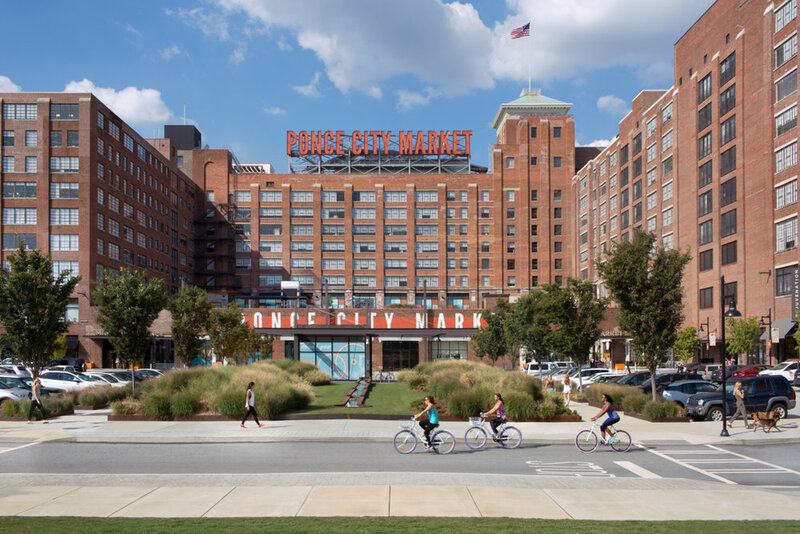 Ponce City Market is a shining example of adaptive re-use. The former Sears, Roebuck and Co. was transformed into a two million square feet mixed-use development, a large portion of this being the Central Food Hall. There’s a little something for everyone inside. Bellina Alimentari has a wide array of Italian gourmet foods and serves house made pasta. Watch Southern heirloom grains milled in-house upstairs at Root Baking Co. and grab a bowl of chef Matt Palmerlee’s soup and perhaps a molasses cookie to go. Sample grilled Indian street food at Botiwalla. Slurp the slow cooked tonkotsu broth at Ton Ton ramen-ya. Slide into a scene from the mid-century with dishes like prime rib with scalloped potatoes and a martini at The Mercury. Ponce City Market. 675 Ponce de Leon Ave NE, Atlanta. 404-900-7900, poncecitymarket.com. Just a 5-minute drive or a half hour stroll on the Beltline’s Eastside trail is Krog Street Market. It’s smaller in size than Ponce City Market but it packs a culinary punch. Newcomer Watchman’s serves sustainable southern seafood and A+ cocktails in a pretty space of shiny teal and hanging plants. Bar Mercado offers a taste trip through Spain through small plates. Scoop up baba ganoush with glorious crisp falafel at Yalla. Restaurateur Ford Fry’s Mex Tex joint Superica has heaping potions of nachos, puffy tacos, and a banging margarita menu. Hop into the coziest townie bar at Ticonderoga Club, where the cocktails are fine and the food is soulful. Krog Street Market. 99 Krog St. NE, Atlanta. 770-434-2400, krogstreetmarket.com. In addition to Ticonderoga, the cocktail scene is strong here. The team at 8Arm can make a classic but their irreverent riffs are more fun to drink from the converted shipping container. At Paper Crane, drinks are described not by ingredient, but with the esoteric feeling each cocktail conjures. Look for “Southern, hospitable, fancy.” Handcrafted cocktails often named for Wes Anderson films and stunning surroundings await at Bar Margot, located in The Four Seasons. Take Marta to Decatur for dining and drinking all within walking distance. Kimball House was a 2018 James Beard Award finalist for Outstanding Bar Program. Its oyster program is widely known as the best in the South, with a happy hour of dozens of varieties available nightly. Similar high praise falls on Brick Store, with a giant selection of beers on tap and one of the largest beer cellars in the world. Their elevated pub fare shines with entrees like smoked chicken and fish and chips. Down a tiny alleyway (lit with neon) lies the subterranean tropical oasis S.O.S Tiki Bar with a menu by Eat Me Speak Me’s Jarrett Stieber. Want to go old school Southern? Mary Mac’s Tea Room has been operating since 1945 and still serves chicken and dumplings, sweet tea, and pot likker with crackling cornbread. You can still get tomato aspic to go with fried chicken at butter beans at The Colonnade. “What’ll ya have? What’ll ya have?” The Varsity, the world’s largest drive-in just celebrated 90 years of serving naked dogs and Frosted orange drinks with a smile. Chef Kevin Gillespie’s Revival dishes traditional Southern classics. Begin with toasted deviled ham tea sandwiches, dig in to cornmeal fried catfish, and end with icebox pie. Often referred to as the Oscars of food, the James Beard Awards recognize the finest in the industry. See what all the fuss is about. Best Chef Southeast 2017 honored Steven Satterfield, whose restaurant Miller Union is a Southern ode to seasonality with a clever wine list heavy in Old War varietals. Hugh Acheson’s (JBF Best Chef Southeast ’12) Empire State South is a destination worthy centerpiece in Midtown, complete with a top-notch bar program from Kellie Thorn and renowned wine program from Steven Grubbs. If weather cooperates, you can even sip and play bocce on the lawn. Anne Quatrano and Clifford Harrison’s Bacchanalia has moved locations since their 2003 award, but it is still one of Atlanta’s best in fine dining with many ingredients sourced from their family farm. Have a hankering for something international? You can find it along Buford Highway, Atlanta’s treasure path that stretches through three counties with everything from dumplings to tacos to pupusas to injera and banh mi and pho. The Atlanta Journal-Constitution has a great guide.